Ultra low Coumarin Ceylon Cinnamon toothpicks with a blend of Cinnamon Leaf and Bark Oil for spicy hotness and sweetness. We think we have made a sublime Cinnamon toothpick. The Ceylon Cinnamon Leaf Oil gives it that super hotness and the Bark Oil adds flavor, aroma and a slight sweetness. Careful, they are hot but that is what our customers wanted, so we made it. 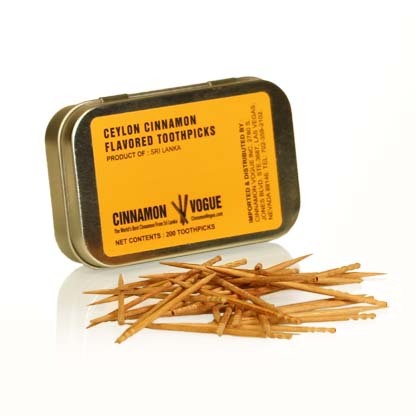 Why Cinnamon toothpicks? Well if you just had lunch with a girlfriend or boyfriend this could save the after lunch kiss. Not only does it freshen your breath, Cinnamon has anti bacterial properties that will reduce the amount of germs in your mouth. Unlike the soft Birch wood normally used in toothpicks, these toothpicks are made with Hard Milkwood which are more durable and longer lasting and does not easily turn into a pulp that get stuck on your teeth like the cheaper birch wood. It also helps to better infuse with the Cinnamon Oil when we make it. The proper way to make a toothpick we think. For hours of satisfaction. If you are a smoker, this is a real great anti smoking aid. Keeps the mouth busy with that hot taste. The more you chew the hotter it gets. Don't chew too much. Just to keep that edge off so you can quit. Taste the goodness of 100% Natural, real Ceylon Cinnamon Toothpicks which are free of sugar and calories. Accept no substitute. We also found a great tin container in just the right size to keep about 200 tooth picks. This container with a hinged lid keeps the toothpicks fresh and air tight and the toothpicks keep you fresh and bright. These are 100% Ceylon Cinnamon Toothpicks. Not the usual Cassia Cinnamon with its high Coumarin content. If you are chewing you might as well as get the good stuff. Note : The label on the can say Ceylon Cinnamon Flavored toothpicks. This means these toothpicks are flavored with real Ceylon Cinnamon Leaf Oil and Bark Oil. It does not contain any artificial or natural flavoring. Not available for Nevada - Due to tax reasons we do not ship to any destination in Nevada either via our web site or on Amazon. Orders recieved via Amazon will be cancelled. Our deepest apologies. Most US orders get delivered within 3-5 business days. International orders average 2 weeks for Canada, 4-5 weeks for Europe and 3-4 weeks for Asia and Australia. All orders ship via the US Postal Service (USPS) with shipment tracking, except large orders (usually over $500) which ship via Fedex. We now ship to Australia, Canada and UK and a select few destinations. $1.50 Customs handling fee applies. Other international customers try Shop and Ship by Aramex who ship to the Middle East and a few Asian countries.